The Taito company met some phenomenal success with its mega-hit Puzzle Bobble - aka Bust-A-Move - that was released in 1994 on the Neo Geo MVS and Taito F3. So, it was quite logical that Puzzle Bobble 2/Bust-A-Move-Again was made a few years later , once the first one numerous adaptations have been sold on various home systems. You need a little relaxation between some King of Fighters and Blazing Star games? This benchmark puzzle game is waiting for you. We're probably dealing here with the most famous representative of the genre, just next to Tetris. This second episode features an improved interface, larger play-screens, some new gameplay mechanics, graphics and a soundtrack improved. You are in command of a directional arrow turning on one-hundred and eighty degrees. The color balls arrive one by one at the bottom of the screen. The goal is to fully clean your area from all spheres sticking into! And to execute this complex task, you have to put balls together, sorted by color: throw a red ball on a group of at least two other red ones will have the whole group explode. All other spheres "hanging" below the red swarm is also eliminated, falling and disappearing from your playground. 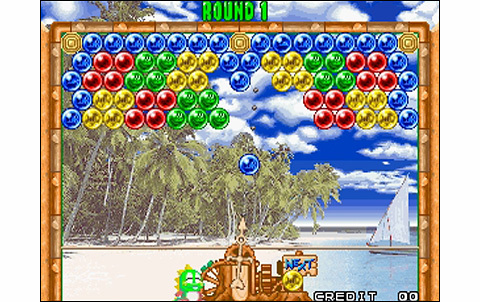 With a slightly updated gameplay kepping simple and ultra-fun, Puzzle Bobble 2 takes you all around the world to face opponents cuter than each other. 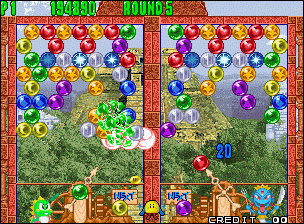 Like in the first game, you embody a little dragon pitching color spheres, and your mission is still to clear the screen of all these balls hanging therein as soon as possible! 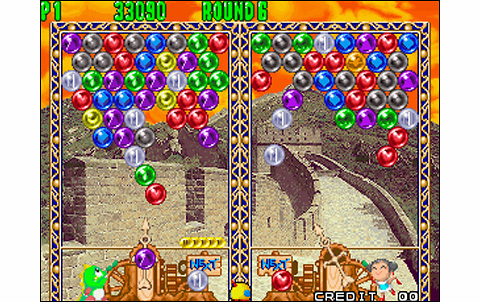 By making combos (ie by dropping simultaneously with gravity, other balls than those you aimed at) you send as many penalizing spheres in the rival camp, greatly delaying his performance at the same time . Pay attention, as the opposite can occur: with the two-players mode, you can imagine the mood at games with friends! 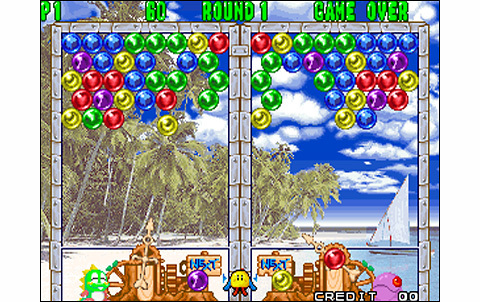 The single player reveals a little more comprehensive and taking than the first Puzzle Bobble. The two different adventures are friendly and offer a good life: choose between a series of matches against opponents at the whim of a playing map on which we choose our direction, or simply play against the clock in various tables. 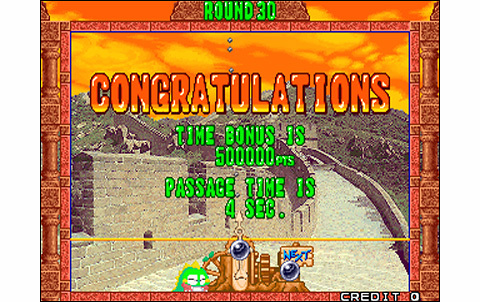 Here are two single game modes considerably extending the soft's life, besides of course of the hi-score challenge, still popular with aficionados. But really, the highlight of the game is its addictive two player versus, just like in the first episode. Hours and hours of intense clashes await you! 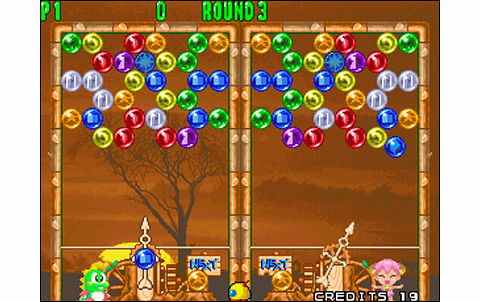 The action is super-taking when two "human" players face. One can improve rapidly, if he only assimilates the mechanics of the game. Then, it's a joy to use tactics and see our opponent collapse under the balls that he was sent by the combo hardly performed! 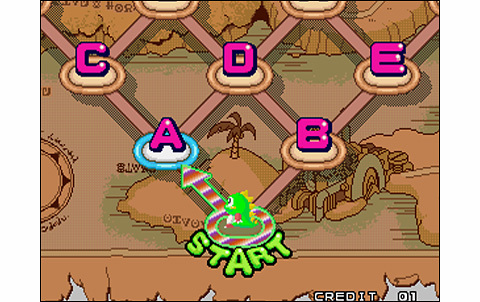 It's these simple principles, this bacic and addictive gameplay which gives Puzzle Bobble 2 an infinite replay value. 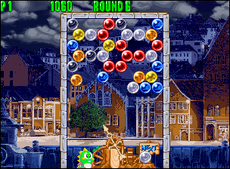 The mechanics of Puzzle Bobble were kept for the greater good, and were just added a few new features, such as the bigger gaming tables, explosive balls, obstructive balls, or even the "Metal Bubble", which destroys all balls with which it comes into contact. Realization, even if it's not a determining factor in this type of game, is a little richer and more detailed than before: we are granted nice varied backgrounds, a substantially improved animation, more varied musics... even the arrow launch is a little more accurate! In short, it's all good news. Here we are in front of an awesome puzzle game, one of the very best of its kind. 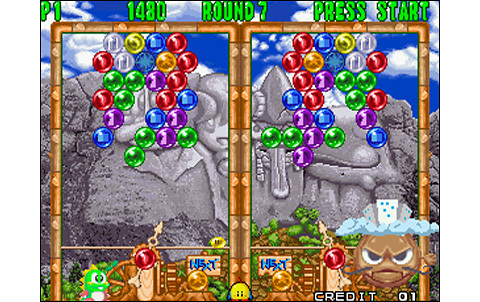 Puzzle Bobble 2 hardly enhances what was proposed by his illustrious ancestor apart from the aesthetics, the one and the other positioning themselves as excellent choices for any fan of this cerebral genre. 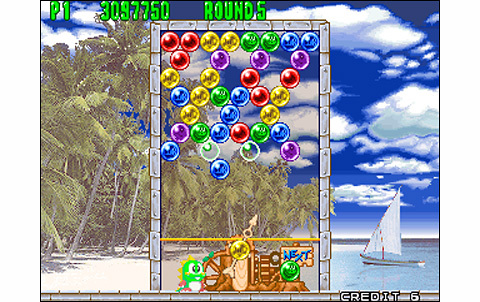 Made of colored balls and digitized landscapes, the backgrounds are way more colorful than in the first Puzzle Bobble. Far from being essential in this kind of game, we still note that everything is moving well and is embellished with some smooth effects. 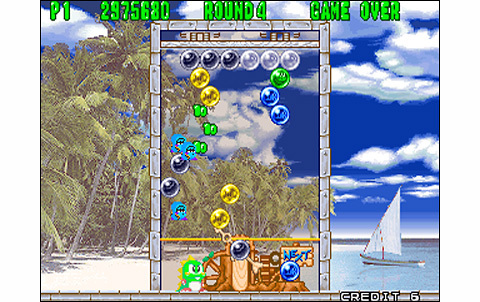 PB2 features good musics and effects , a little more varied than in the first Puzzle Bobble. Sympathic single-player modes, including a map where you can choose your path. For two players, the replay value is almost infinite! Even people unfamiliar with videogames can enjoy this game instantly. 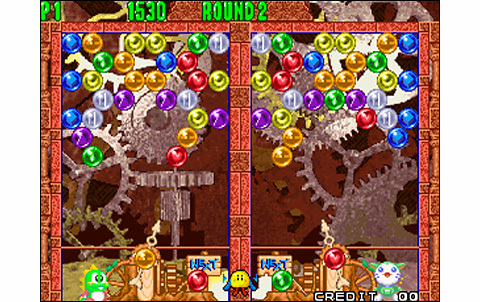 The mechanics are simple but taking, and versus are pretty intense when both players have mastered a little the game. 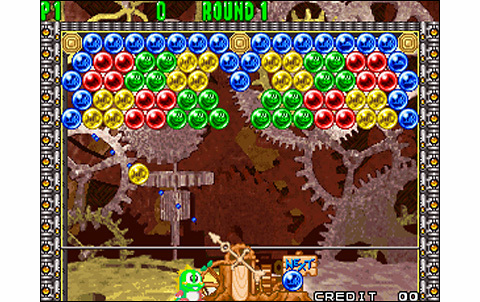 Puzzle Bobble 2 is a superb puzzle game, with a legitimate reputation: simply one of the best of the genre,incredibly addictive when playing two. 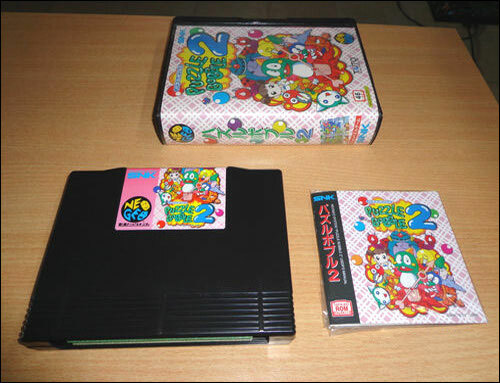 Rare in MVS, PB2 is almost impossible to find in a conversion that is not a bootleg. Rare and therefore expensive: it's about 150/200 euros for a boot! 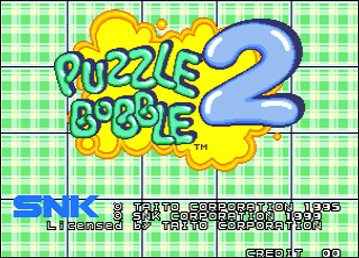 The first Puzzle Bobble game, in original MVS convert, is findable for generally less than 100 euros, so I wisely recommend this one.